This was really good, and I love that I can easily throw this kind of meal together cause I have such a well stocked pantry and fridge. 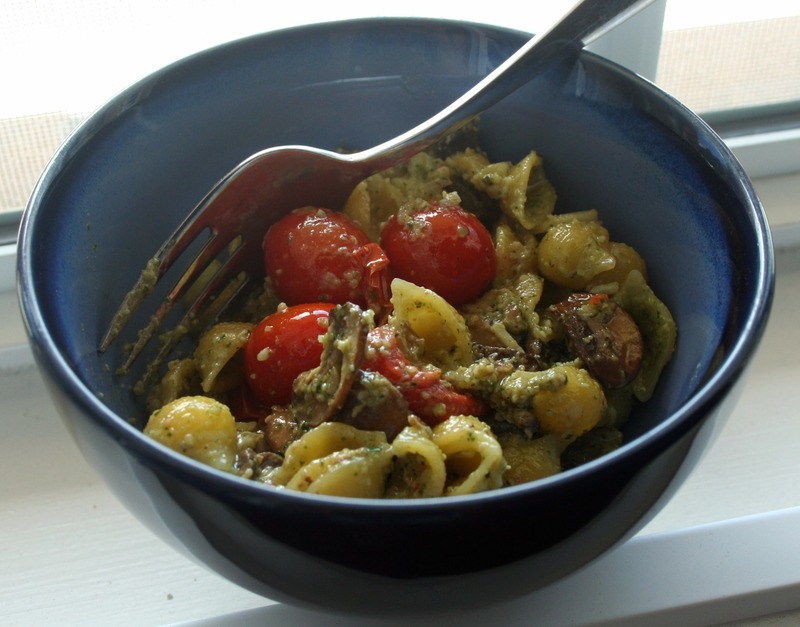 I was able to use some of the pesto that I made over the weekend, crimini mushrooms, minced onion and some grape tomatoes to create a tasty pasta “sauce”. Today I picked up some quinoa pasta shells because there is way more protein and other good-for-you stuff that regular pasta can’t offer. I would have loved to add some peas to this, but sadly I had no frozen peas! Anyway, I am really happy with how this turned out, and I think having pesto on hand in the fridge or freezer is something I will have more often. It isn’t hard to make and it tastes worlds better than any pre-made pesto with unpronounceable ingredients. Thanks for reading, enjoy! This looks delish! keep going with yo bad self and post more foodz!